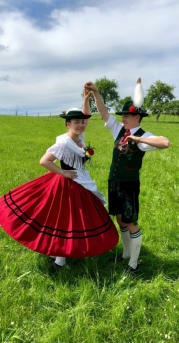 Schuhplattling: Nothing is more recognized throughout the world nor more representative of Bavaria and the Austrian Tyrol than Schuhplattler dancing. Schuhplattling, which literally translates to shoe-slapping, can be traced back to the 11th-14th century. It is considered a mimic of the male Auerhahn bird who courts the female by flapping his wings and kicking up his feet around a circle. The woman plays her part by spinning, as a way to challenge the man. Indeed, it is difficult for the man to catch the woman to waltz with him. 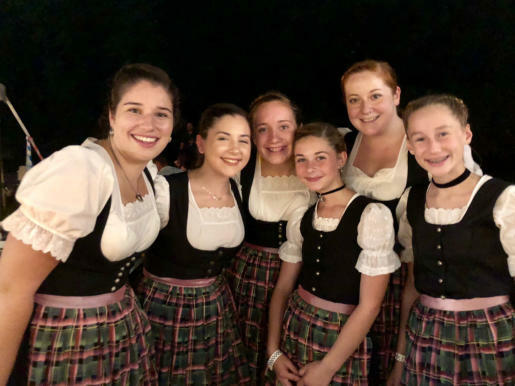 The Tracht (formal dress-wear) worn by the men and women dancers has remained unchanged, for the most part, for over 200 years. 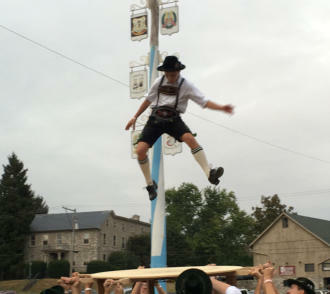 The Lancaster Alpenrose Schuhplattler Verein performs a variety of folk dances from both Germany and Austria. Adults and children of all ages participate in these dances. The group performs at our 2 annual fest fundraisers: Sommerfest (2nd weekend in June), Oktoberfest (3rd weekend in September), and also at most scheduled club events.